For the hostname is working and I'm able to visit the hostname and the directadmin control panel over SSL, the issue is I can't get certificates to work for my other domains using the directadmin control panel or SSH. What did I try to solve the issue? If I login to SSH: I'm able to add up to 100 (sub)domains to the hostname, how can I add Let's Encrypt certificate's for my domain's and get them to work? I don't want to use the hostname certificate for the domains..
Let's Encrypt is running and the certificates renew automatically, the only domains that can use it are the hostname and some related domains, The latest version of letsencrypt.sh for directadmin servers is installed. I'm not able to use certificates for my other domains hosted on this server.. Please ask in the comments If you're in need of more information regarding this issue..
Let’s Encrypt offers Domain Validation (DV) certificates. We do not offer Organization Validation (OV), Extended Validation (EV), or wildcard certificates, primarily because we cannot automate issuance for those types of certificates. Yes, the same certificate can contain several different names using the Subject Alternative Name (SAN) mechanism. With SAN you have one certificate that covers all your domains. 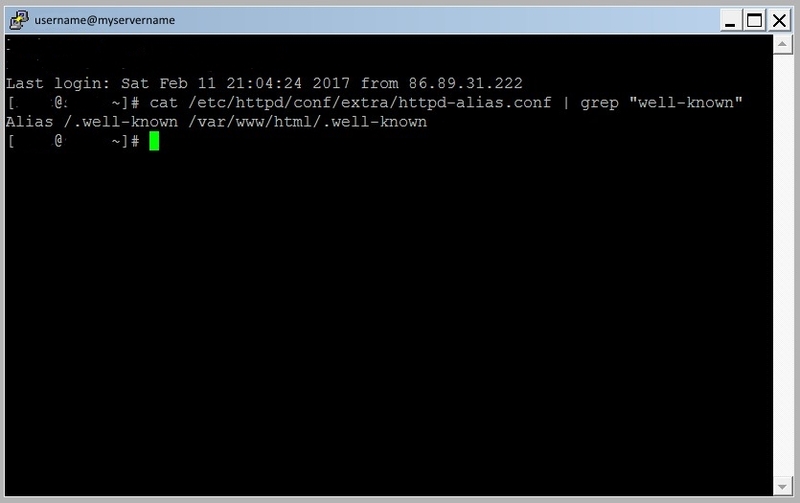 As TLS connection is established before the browser sends the Host: header, your HTTPD doesn't know which certificate to use for the handshake and matches the first one available that matches the IP address. Therefore there was a long era you actually needed one IP address for every single certificate. SAN was the only way to have several HTTPS sites on same IP and the certificate needed to be reissued whenever a new alias was added. That was until Server Name Indication SNI, an extension of TLS which allows the client to include the requested hostname in the first message of its SSL handshake. SNI has been there since OpenSSL 0.9.8f from Oct 2007. It has been supported by all major browsers for years. You can easily configure it on Apache, it has been supported by Nginx since 0.5.23 and was introduced in IIS 8.0. As you already have multiple certificates rather than SAN, you should use SNI. Allowing SNI is possible on DirectAdmin. Unfortunately Serverfault won't give support for web hosting control panels.